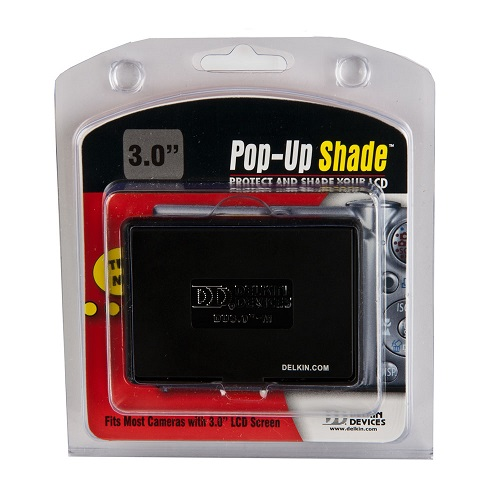 Delkin's Universal Black Pop-Up Shade, custom designed for 3.0 inch LCD displays, is the only armor and glare guard option for your digital camera LCD. The simple flip of a finger triggers a three-sided canopy to provide an instant safeguard from bright outdoor light while combating debris, fingerprints and damage to the display. By attaching to your camera with a strong easily removable adhesive, the Delkin Pop-Up Shade leaves camera usage virtually unconstrained. Easily attach and detach either the canopy or the entire accessory as desired.